90% of FMCG retail growth in the last year came from online. For today’s brands, digital is no longer a possibility – it’s a necessity. But consumers now have more options than ever when it comes to purchasing goods online. The popularity of smaller startup brands is rapidly increasing, threatening to give Big CPG a run for its money. 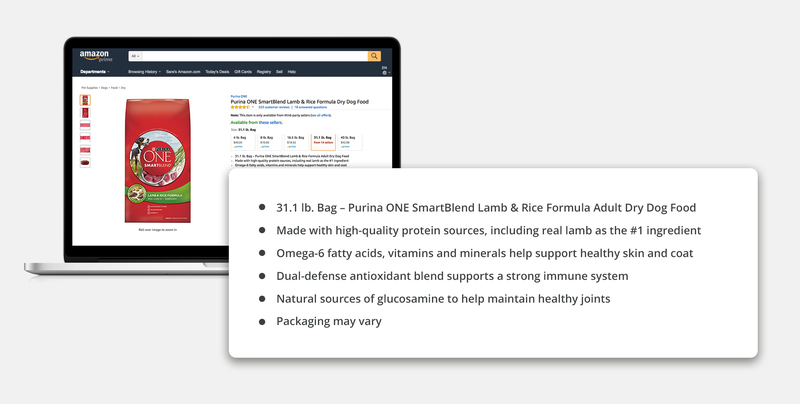 Knowing how to write product descriptions that sell is therefore a major key to success for traditional CPG firms. To win at e-commerce, these brands have to create engaging, customer-focused content that helps their products stand out from competitors. 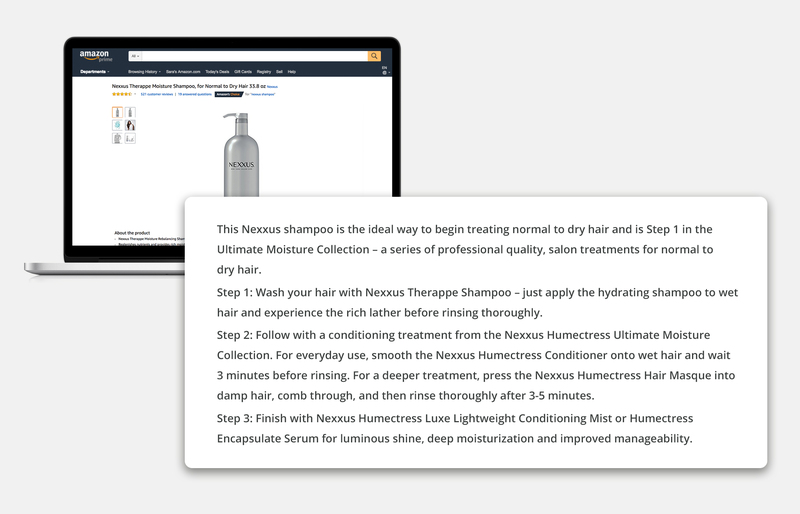 Here are eight easy ways that brands can create product descriptions that boost conversions, drive revenue, and build brand loyalty over time. Optimize for real consumer search behavior. But choosing the best keywords to target isn’t as easy as it may seem. 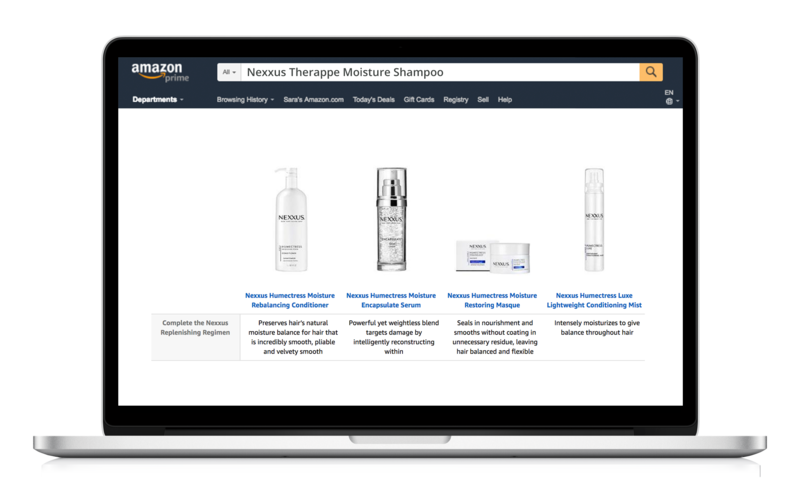 49% of product searches now start on Amazon, and another 15% start on retailer websites. Finding the right search terms therefore goes beyond simple Google keyword research. To optimize effectively, you also need access to a comprehensive set of site search data from your most important retail partners. And a one-time optimization exercise isn’t enough. Unlike the physical shelf, the digital shelf changes constantly, with positions fluctuating on a monthly, weekly and sometimes daily basis. Therefore, brands must be able to continuously track their search rankings on retailer sites and implement additional content optimizations in real time to regain premium product placement. OneSpace is the only platform designed to help brands achieve the perfect digital shelf. By combining the industry’s largest database of consumer search insights with proprietary performance monitoring tools and on-demand content optimization services, we enable brands to respond to market changes and execute product page updates with unrivaled speed and scale. Learn more. Speak directly to your target customer profile. Once shoppers have found your product pages via search, the next step is gaining trust using personally relevant and engaging product page content. 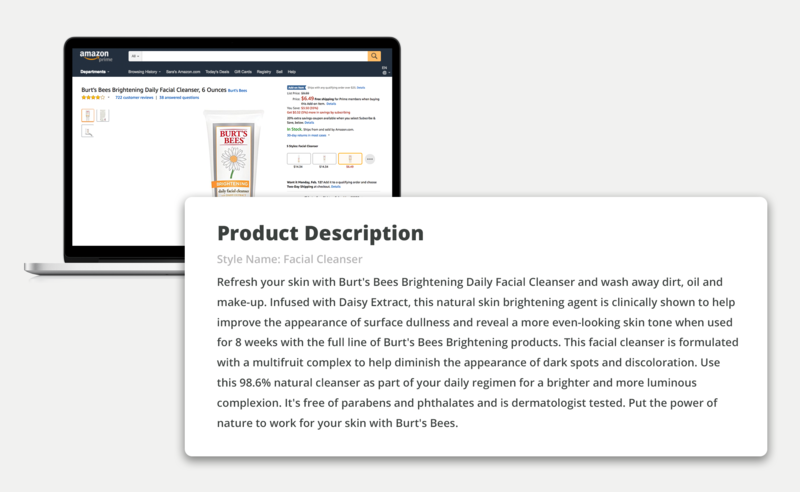 Your product descriptions should speak directly to your target customer profile, using familiar terminology and drawing on empathy to appeal to their specific pain points, priorities and concerns. Most manufacturers have different brands and product lines that cater to different customer profiles. If you haven’t already, it’s imperative to document these various buyer personas and the specific products they apply to. Do your buyers predominantly identify as male or female? Which generation(s) do they belong to? Do they care more about cost, value or quality? What social causes are important to them? What modes of persuasion do they respond to (emotion, logic, ethics)? How would you talk to them in person? Share your completed personas with your content team, whether in-house or part of an agency, and make sure they’re leveraging them when writing your product descriptions. Pair features with tangible benefits. On most retailer websites, your bullet points are the first thing customers see after your product titles and main images. These bullet points should highlight the most important features of your products, but they should also convey the key benefits those features offer consumers. These benefits can often serve as the key differentiator when customers compare your products to those of your competitors, making them an important part of writing product descriptions that sell. How does it make customers’ lives easier, healthier or more enjoyable? What types of experiences will customers have when using the product? Because bullet points possess such valuable real estate on your product pages, you’ll want to make sure you leverage the maximum quantity and characters allowed for each listing whenever you can. It’s also best to include only one feature/benefit pairing per bullet point for easier comprehension. For Amazon listings, the first bullet point should always describe exactly what will be shipped to the consumer. The bullet points are concise and consistently formatted, and each highlights a single feature, making it easy for customers to scan and comprehend. Most importantly, three of the six bullet points clearly call out the concrete benefits of these features. 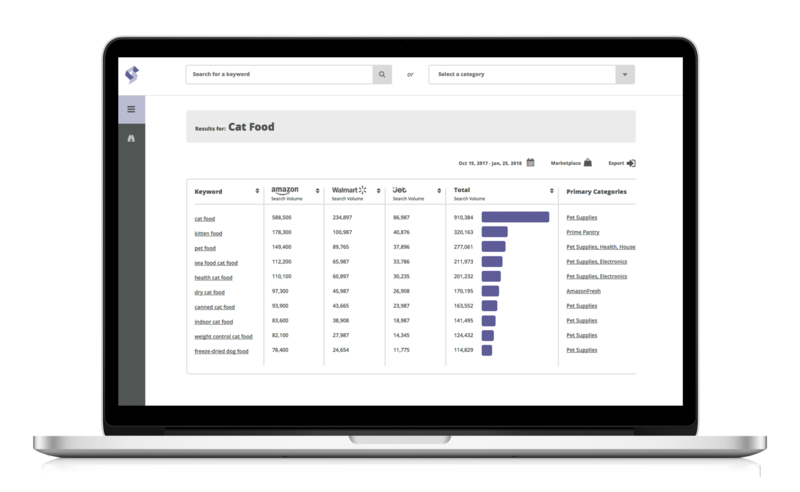 Bonus: See how OneSpace saved Purina 67% in agency-related costs. It’s easy to fall into the trap of padding your product descriptions with generalities, filler language, and superlatives in order to meet a retailer’s minimum required word count. 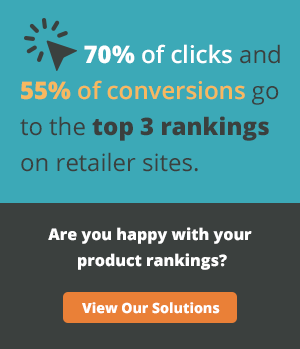 While doing so may get your products online faster, it does little in terms of getting shoppers to convert. For your product descriptions to sell, they need to focus on the concrete details that are most important to your target customer profile. Rather than making vague claims like “helps improve the appearance of your skin,” this description gets specific by calling out the most important ingredients (“infused with daisy extract,” “formulated with a multifruit complex”) and their benefits (“to help improve the appearance of surface dullness and reveal a more even-looking skin tone,” “to diminish the appearance of dark spots and discoloration”). Storytelling is one of the most effective strategies you can use to sell your products. 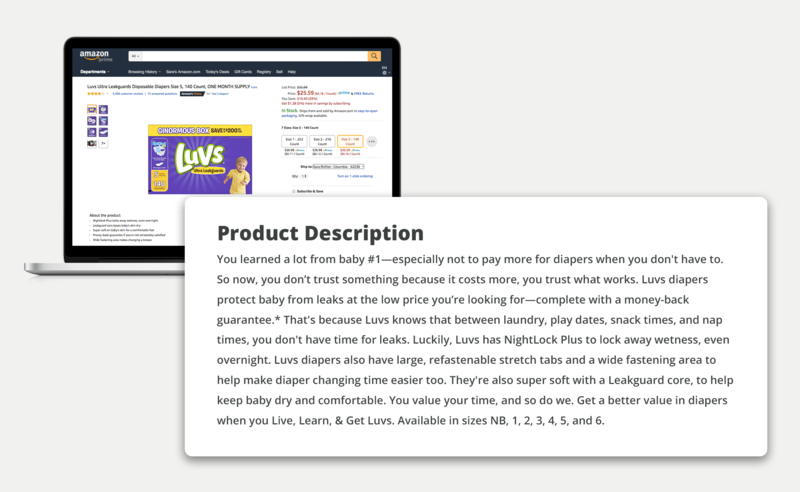 Research has shown that product pages with detailed stories pull in more money than those with standard descriptions. Why? Because good stories appeal to readers’ emotions, engaging the right (or more creative) side of the brain. Facts, on the other hand, appeal to readers’ logic, engaging the left (or more pragmatic) side. And feelings, not facts, influence a majority of our decisions: Experts say that 80% of the choices Americans make are driven by emotion. "Tell me a fact and I’ll learn. Tell me the truth and I’ll believe. But tell me a story and it will live in my heart forever." Research shows that shoppers are more likely to purchase an item once they’ve held it in their hands. Because online shoppers can’t touch, feel, smell, taste or see your products in person, it’s important for your descriptions to use sensory language that conveys the experience of using your products. Sensory words like “savory,” “moist,” “citrusy” and “rich” are essential because, like storytelling, they activate different parts of the brain. When you read non-sensory words, your brain processes them as simple text. But when you read sensory words, your brain processes them as if you’re actually tasting, seeing, touching, smelling, or feeling whatever is being described. Remember to up- and cross-sell. 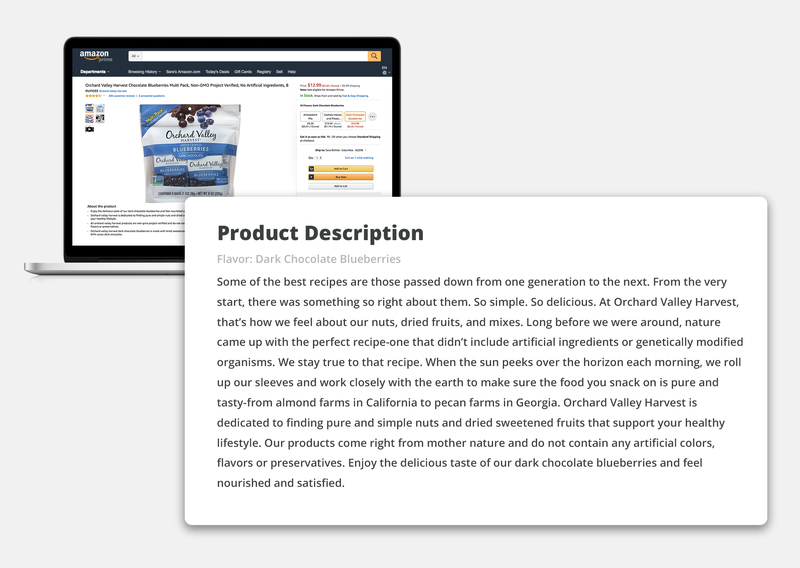 Product descriptions are a great place to cross-promote related products. Whenever applicable, your content should mention (and link to) similar items that a customer may also be interested in buying. These items should naturally complement the main product on the page. Accuracy is one of the most important factors to take into consideration when creating product descriptions that sell: 98% of shoppers have been dissuaded from completing a purchase because of incomplete or incorrect product content, and 50% have returned an item they bought online because it didn’t match the description. One way to ensure the accuracy and completeness of your descriptions is to regularly monitor the customer-submitted questions and reviews on your product pages. 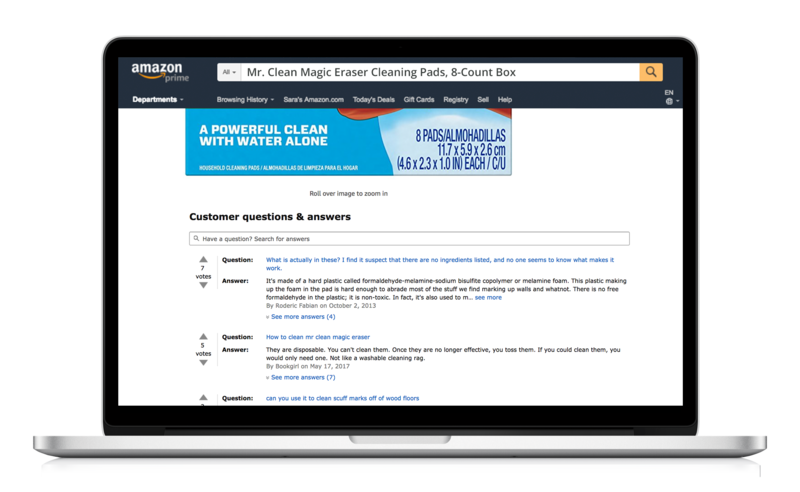 This user-generated content provides a treasure trove of insights, revealing the most common questions about and issues with your products. Proactively addressing these concerns within your descriptions can help you increase sales. It’s also important to update your descriptions any time you change a product’s packaging, formula, ingredients, flavors, or available sizes. 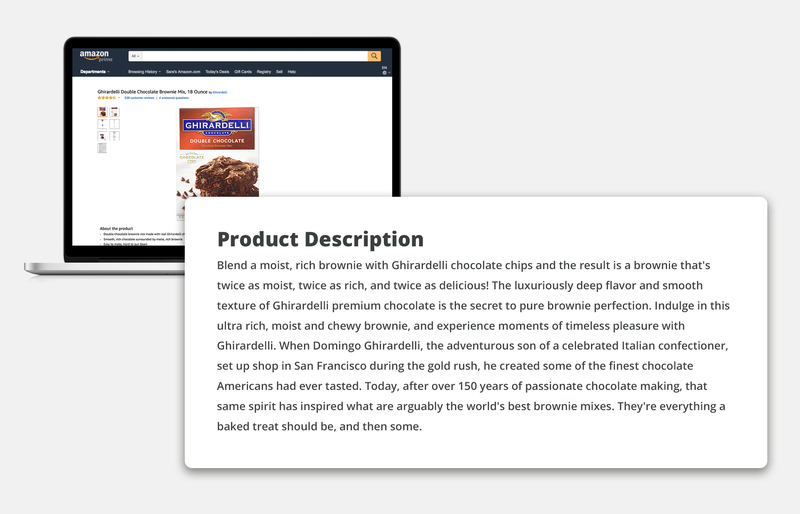 There are many factors to take into consideration when it comes to writing product descriptions that sell. However, incorporating these eight best practices are a surefire way to guarantee success and stand out from the crowd.